The genesis of the Fourth Symphony possibly goes back to the 1870s when Brahms was studying the Bach Cantata Nach dir, Herr, verlanget mich, whose chaconne theme forms the nucleus of the finale. Around 29 August 1885 Brahms wrote to Hans von Bülow from Mürzzuschlag in Styria: However I have a few entr'acts - which together form what one would usually call a symphony. [...] I am afraid [...], it takes after the climate in this region - the cherries do not ripen here. Yet we are by no means speaking of sour cherries here. The work is today a part of the canon of classical-romantic symphonies. 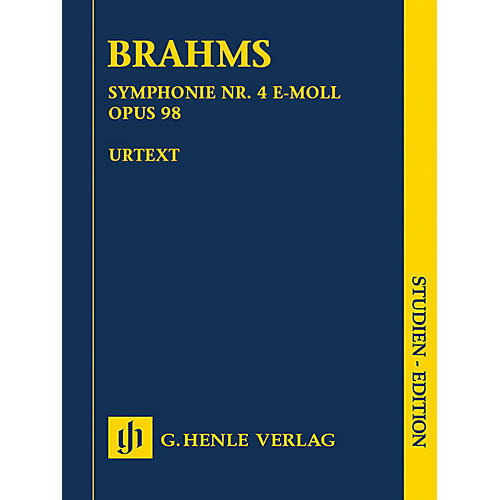 Our handy and inexpensive priced study edition is based on the musical text in the Johannes Brahms Complete Edition (HN 6015).